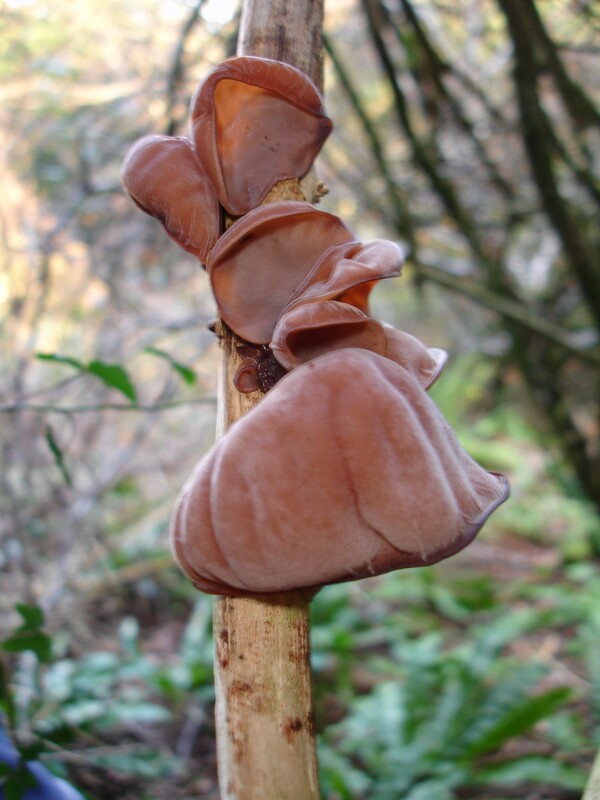 Formally known as Jew’s ear, the wood ear fungus can be found throughout the year, common on elder. 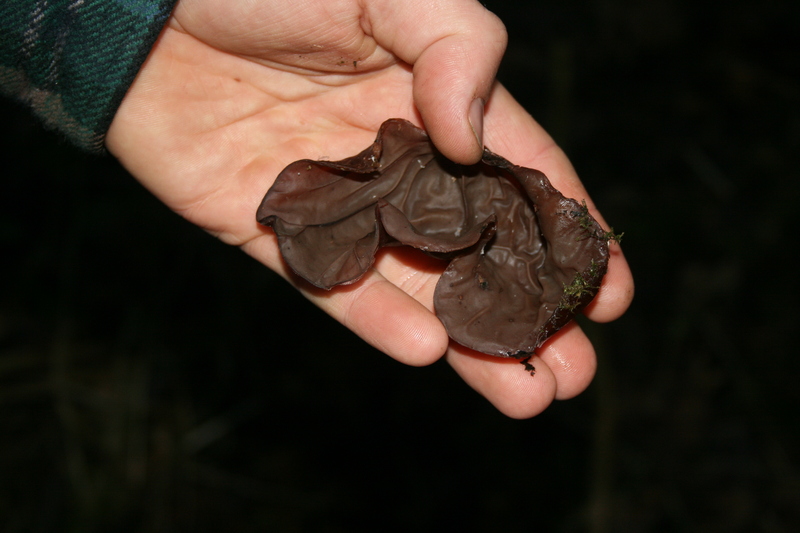 An ear shaped bracket fungus, 2-7cm across, usually found in clusters, brown in colour jelly like in touch. 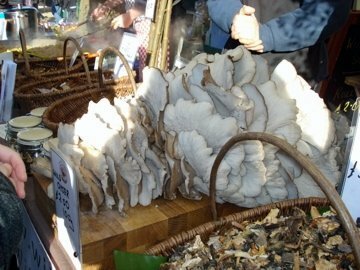 Its an edible fungus much loved in China where soups featuring it are used as a remedy for colds. 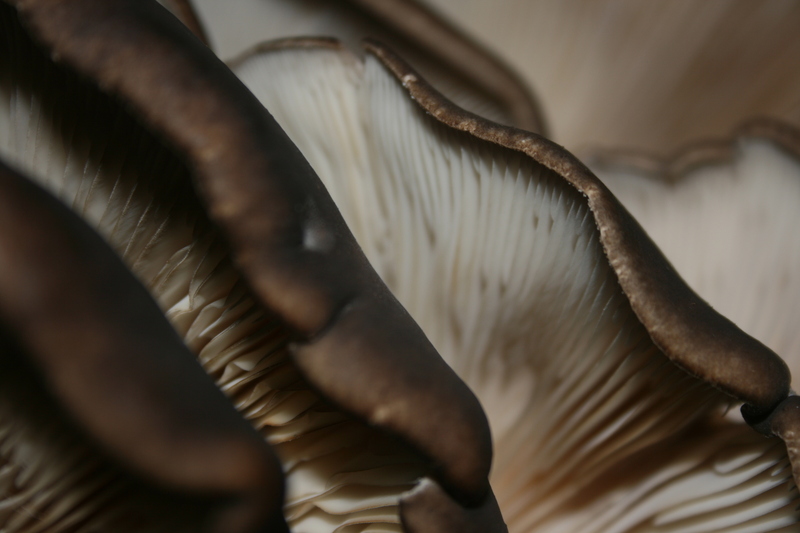 However we find it best used fresh in stews or dried and ground down into a powder as a flavouring. Clean and soak the wood ear and chop roughly. Heat the sugar and water until sugar melts and the mixture is almost boiling. Drain the wood ear, add to syrup and steam for 1 1/2 hours. Serve hot or cold. 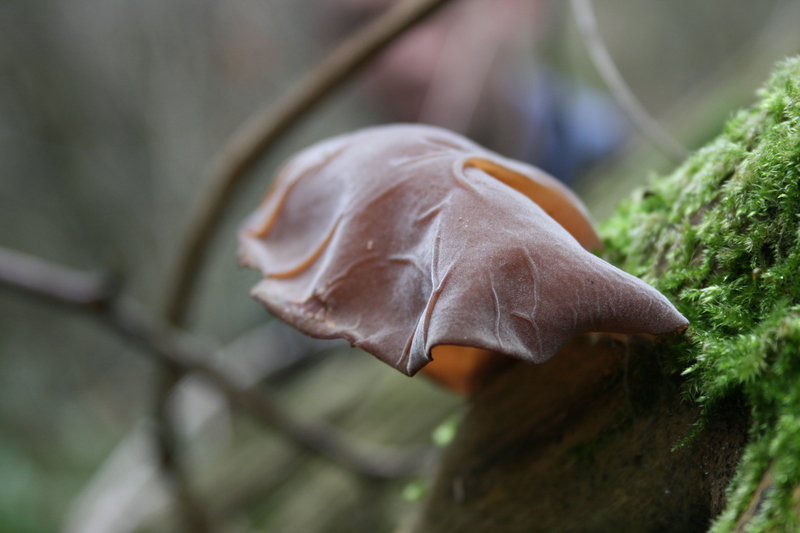 Our best supply has come from dead or dying branches of beech can also be found on ash around late autumn, a fan-shaped bracket fungus 20 cm across, cap well shaped convex at first then flat Grey or slate blue in colour. Melt the olive oil in a large skillet over medium-high heat. Add the mushrooms, onion, and garlic and cook for 5 minutes, stirring frequently. Pour the stock into a large soup pot and bring to a boil. As it comes to a boil, add the carrots to the onion/mushroom mixture and cook for 5 minutes. Next add the tomatoes to the skillet and cook for another 3 minutes. Once the stock is boiling, add the diced potato pieces to the soup pot and let them heat for 5 minutes. Now add everything from the skillet (onions, oyster mushrooms, garlic, tomatoes, and carrot) to the soup pot. Turn down the heat to medium and cook everything together for 10 minutes, or until you’ve reached your desired taste, texture, and warmth for all the ingredients. Season with salt and pepper and serve! 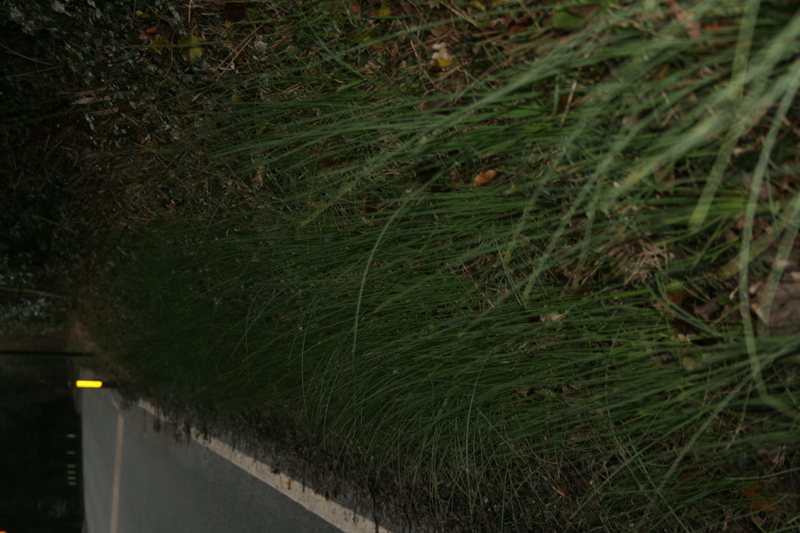 Medium perennial 30-60cm leaves stiff grass like semi cylindrical, hollow and grooved , underground bulb onion like 1-2cm – leaves during winter & spring bulbs late spring and early summer, this is our first new find of the year found on Grassy banks (see below) or also field edges. 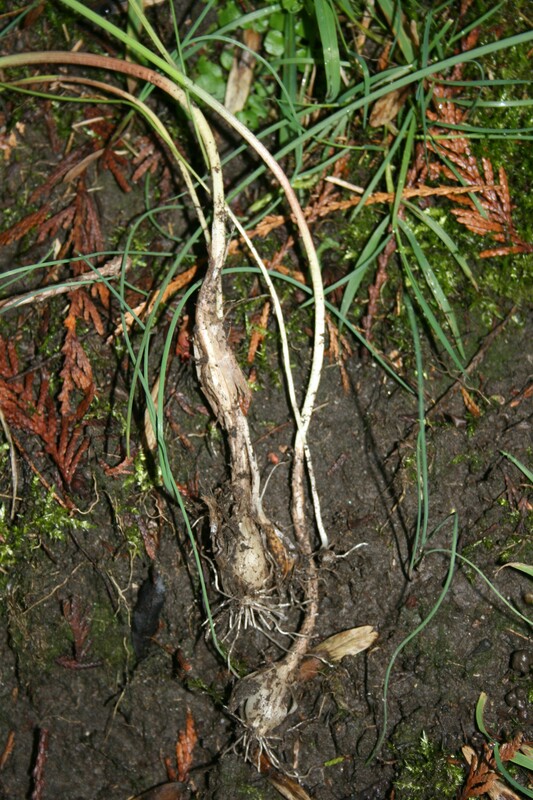 Typically harvest in June or July when the bulbs are at their plumpest. Grub the plant up, strip off any bulbs and plant these back in your garden (but use the large ones to pickle) then cut the bulb from the base of the plant and strip off the fibrous outer layer before use. Peel the crow garlic bulbs then slice any of the larger bulbs in half then mix in a bowl with the tarragon, thyme and black peppercorns. Meanwhile, combine the vinegar and sugar in a pan. Cook over high heat until boiling then stir-in the mustard powder and celery seeds. Boil for 5 minutes then add the black peppercorns and sea salt and boil for 5 minutes more. Remove from the heat and strain to remove the spices. Place the crow garlic bulbs and herbs in sterile jars, filling to within 2.5cm of the top. Pour the hot vinegar mixture over the top, filling to within 6mm from the tip. Seal well and store in a cool, dry, cupboard for at least three weeks before using. Refrigerate after opening.